We can all agree that cannabis is an absolutely beautiful plant. However, it can be difficult at times to capture that beauty through photography. Whether you’re a consumer who wants to share your gorgeous buds on social media or you’re a cannabis business wishing to showcase your inventory in the most appealing way possible, the quality of your photo will make a huge difference. But how can you get professional-looking results without having to invest in thousands of dollars of camera equipment? 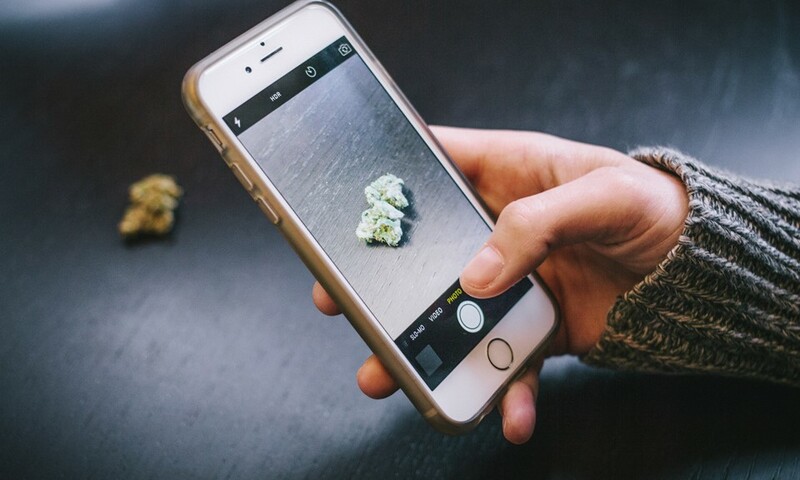 Believe it or not, the technology we need to take better pictures of our cannabis is in our very hands. Our smartphones are perfectly equipped with the tools we need to get our trichomes sparkling in the spotlight. With the help of these five hacks, you can take your smartphone bud shots to the next level. There are several ways to prevent camera shake when taking pictures with your smartphone. The first is to invest in a tripod. There are plenty of inexpensive smartphone-specific tripod options available online; though if you don’t feel like shelling out the price for one, try using a kickstand or even propping/wedging your phone up in front of your subject. This will eliminate most of the camera shake, allowing for crisp and clean details to shine through in your photos. Using the touchscreen, or even a button, on your phone to take a photograph can create enough camera shake to compromise a photo. iPhone users, did you know that you can use the earbuds included with your phone as a remote trigger while taking photographs? The process is simple: Just plug your earbuds in and use the volume control buttons to take pictures while in the camera screen. Using both of these first tips together will ensure that your photos are tack sharp and free of blur. There are a myriad of applications in the marketplace that will help you to edit photographs after you have taken them. But did you know that some applications can actually help give you even more control before your picture is even taken? While in most default camera screens you don’t have the option to adjust exposure settings such as shutter speed and ISO, these applications, like Manual for iPhone (pictured above), open up the controls back to you so that you can snap a pic of your perfect dab while also letting the perfect amount of light into your smartphone camera. Try to stay away from your camera’s default flash setting. This flash will guarantee an overexposed and blown out final shot. When the only white you want to see in your shot is the head of your trichomes, it’s best to use softer light. Direct light is very harsh, casting nasty black shadows and overexposed patches where direct light hits your subject. To combat this, use indirect light, or bounce your light off a white surface. Also, try diffusing your light with a white, semi-opaque, surface like a paper towel, sheet, or some printer paper. A macro lens is fantastic in that it allows you to get extremely close to your cannabis, thus opening up an entirely new universe of colors and details. With a macro lens touting 15x or more magnification, you can cover an entire frame with just one trichome covered pistil. Some of the most creative cannabis shots utilize macro lenses. Luckily, today you can find a macro lens for your smartphone for for relatively cheap. If you do a simple search online, you will find a variety of options at virtually any price point. Don’t worry about dishing out mega bucks; you wont need to. The cheaper models work perfectly fine for taking bud shots. Looking for more great tips to make your cannabis business stand out? Check out Leafly’s marketing services! In the meantime, good luck and happy shooting! Great advice. Thanks Leafly. You rock!